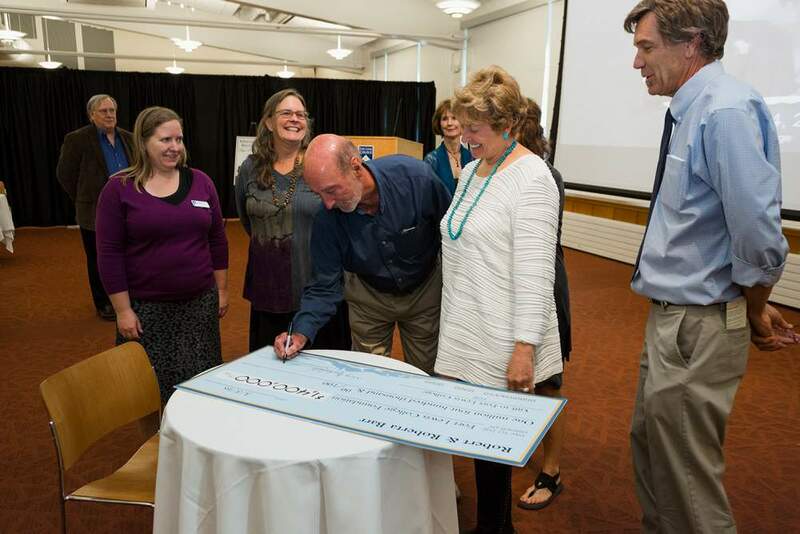 Rod Humble, one of two trustees for the Robert M. and Roberta Armstrong Barr Foundation, makes the $1.4 million gift to Fort Lewis College for teacher scholarships official by signing the giant check as fellow trustee Judy Michalski, second from right, and associate professor Richard Fulton, FLC director of education, look on. The signing was part of a party honoring teachers at the FLC Student Union on Sept. 14. 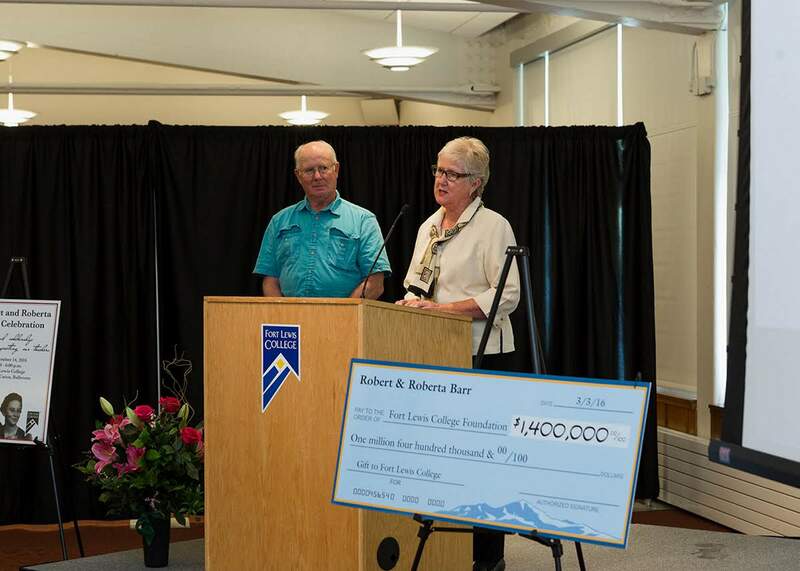 Ed Zink and Anne Putnam talk about Roberta Barr at a party celebrating teachers and the $1.4 million donation from the Robert M. and Roberta Armstrong Barr Foundation to Fort Lewis College for teacher scholarships during a party in the FLC Student Union Ballroom on Sept. 14. Roberta Barr was a force of nature in Durango School District 9-R for more than 40 years, beginning her career in the one-room Falfa and Hermosa schools and ending it as the principal of not one, but two schools, Mason and Park elementary schools. In those four decades, she influenced hundreds of lives, something I know because of stories from former students like Michelle Klein and Drs. Margaret Liu and Genet D’Arcy. She died almost two years ago at the age of 99, but her legacy will live on for generations because of the scholarships she and her husband, Robert, donated to her alma maters, Fort Lewis and Western State colleges, to support students planning to become teachers. Barr donated $200,000 before her death, and last spring, when their foundation was closed out its trustees made the largest donation in FLC’s history, $1.4 million. The endowment will bring in $50,000 to $60,000 annually for scholarships, and that’s enough to change people’s livers. And if that’s not an excuse for a party, I don’t know what is. On Sept. 14, FLC and the Teacher Education Department honored the Barrs and hard-working teachers, the students they have supported and those they are currently supporting with a gathering in the Student Union Ballroom. The party included the signing of the symbolic gigantic check by trustees Judy Michalski and Rod Humble and remembrances of Barr by Ed Zink and Anne Putnam. All in remembrance of the grande dame of the Animas Valley and her commitment to our area’s children.